The Flash returned this week without missing a single step. From great comic parallels, incredible plot/character development and a timeline tie-in to Arrow that was too good to pass up, “Flash Of Two World” lived up to all the hype. So let’s break down the episode and see what’s coming next as the evil Zoom continues his war against the Flash. Long time readers of mine will already be familiar with the idea of “Multiverse” from my Pokemon Multiverse Article. Although if you were just as confused as Joe West, I’ll explain things again. We’ve seen signs of this in the show and so have the characters with the growing number of so-called “Dopplegangers”. If certain citizens and criminals were exposed to the particle accelerator in the other world, then what else is changed? We know that Eobard pushed up the timeline in this universe so Barry could get his powers sooner, so perhaps the ‘Barry Allen’ Flash hasn’t been created in Earth-2 yet. Or maybe Earth-2 Barry is fated to become electrician after all. 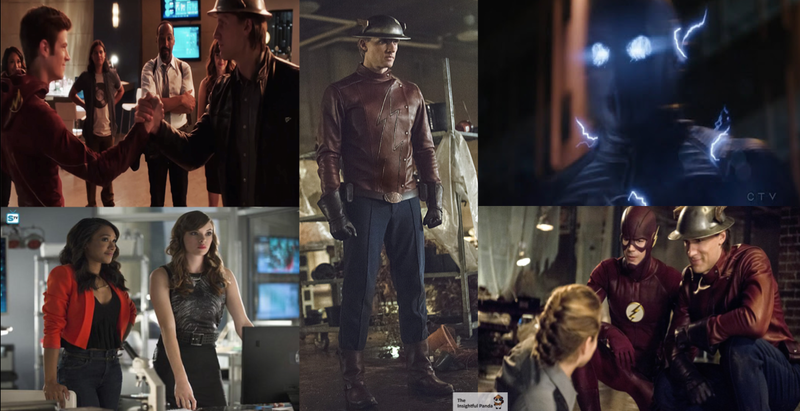 Whatever the case is, Eart-2 already has its own Flash and that is Jay Garrick, The Crimson Comet. Although, if I’m to take all the talk a little further, then we’re bound to meet more than just “one more” Flash. Garrick spoke of Zoom wanting to eliminate Speedsters from every universe. We already know Wally West is coming so will he be from Earth-2, Earth-1 or somewhere completely different. There’s more than one Flash in the comics and judging from Garrick’s warning, Barry might need to assemble a team of Flash from “multiple” worlds to take down this true Speed Demon. Last week’s episode of Arrow referenced ‘Flash Day’ and on this week’s Flash we heard about the Green Arrow’s proclamation. So continuity wise, this episode of The Flash picks up almost immediately after the last episode left off. And we learned that the Green Arrow’s speech was “last night”. This means that the first episodes of Arrow and The Flash more or less took place at the same time – give or take a few hours. And this week’s Flash took place the next day. How this continuity and parallel timeline will continue over the Season remains to be seen; but considering these are sister-shows and Arrow already gave us an end moment ‘6 months later’, I’m going to continue to map these shows timelines like I did for the end of last season. If there is one person we can count on to get excited about Metahumans, it’s Cisco. He is the perfect fanboy and takes his naming responsibilities very seriously. So if one day he was to discover he had powers too wouldn’t he be happy? Well that’s exactly the question Stein wants answered as Cisco tries to conceal his ‘vibe’ powers this episode. So why hide them? Well it seems Barry isn’t the only one with resulting trust issues from Wells. When Cisco first truly learned about his powers it was from Wells who called them a gift. But what would you think of a gift if it came from someone who caused nothing but death and pain for those you cared about. This is why Cisco is afraid of his powers. Yes they’re from the Particle Accelerator Explosion just like Barry and the others; but the fact that Wells specifically called them a gift makes Cisco afraid. What if these powers will hurt his friends? What if they’re a back up plan from Wells? One day Cisco will learn the gift of his powers; but that day won’t happen just yet. Last week we began to hypothesize who Zoom could be and this week we got some new details to add to the list. As Jay Garrick described him, Zoom is a Speed Demon in every sense of the phrase. He’s been on a killing spree and of particular interest to him are those who have Speed Powers as well. Though we didn’t just hear about Zoom in this episode, we also saw some shots of him and his costume looks strikingly familiar. The thunderbolt side lines, the central insignia and ear bolts make his costume look like a corrupted version of the Flash suit. With all the talk about ‘alternate selves’ and the brief topic of ‘Earth-2 Barry’, I still think this could be the DCTV adaptation of Future Flash, where Barry Allen travels through time killing former villains and others in order to change things. Is this a Barry Allen who no longer trusts anyone but himself with the Speed Force? We’ll have to keep an eye out; but the suit and motives do seem pretty close. The only other option is the Black Flash who is actually like ‘Death’ for Speedsters. This does actually fit the style quite well, but the Black Flash has no identity but is rather the personification of Death. The problem here is that making Death the actual season villain seems a bit much – or at least too early. Additionally, the blue lightning doesn’t match. Wells is alive? But how? When? Why? What’s going on? Well if you stuck around for the Post Credits scene you would have found a slightly different Central City – with a slight Golden hue – and a tour being given of STAR Labs culminating with the ‘man who saved Central City’ Harrison Wells! The full ramifications of this will be explored in future episodes but there are some key things to point out. For starters, the ‘golden hue’ suggests this is most likely Earth-2 aka Jay Garrick’s world considering he is often referred to as the “golden age Flash”. Regardless, this is at the very least a different Earth. Whether Wells here is good or bad remains to be seen; but considering the ‘evil Wells’ was actually Eobard Thawne, here he could most likely be good. 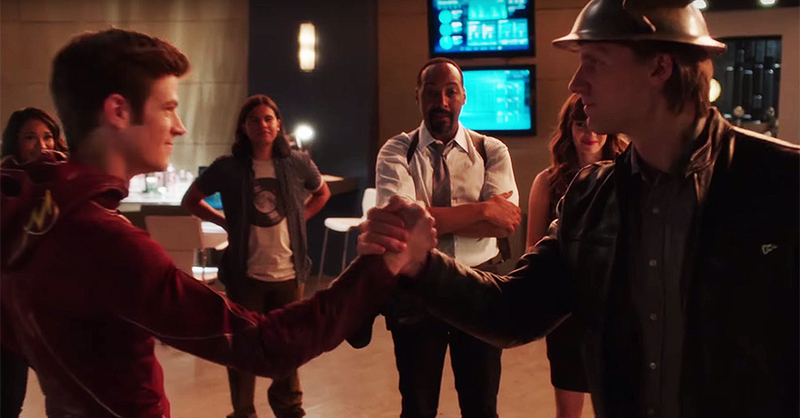 Although if you thought Barry had a hard time trusting Jay this episode, you can imagine how much harder it’ll be if/when Barry and Earth-2 Wells cross paths. 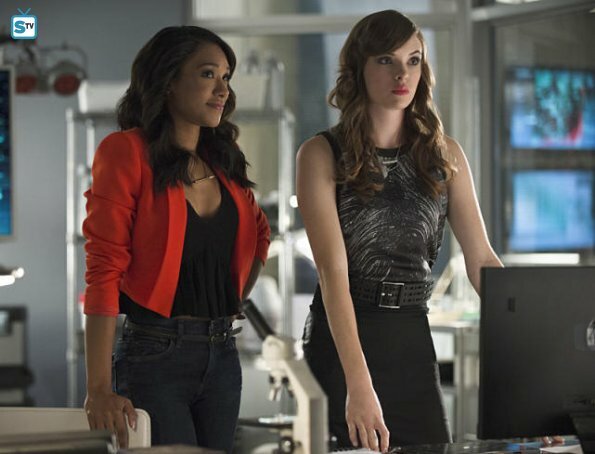 What purpose this new Wells will serve remains to be seen; but it wouldn’t be out of the realm of possibility to suspect that he’ll become a recurring character – possibly to fill Stein’s shoes once he leaves for Legends of Tomorrow – and could also serve as a reference point should Barry ever travel to Earth-2. Now if you’re wondering if this alternate Wells could be Zoom … that I wouldn’t count on. Whereas this Wells ‘could’ be evil since the Wells we met last season was a fake; it would still be pretty poor writing on the Flash Writing Team to make Tom Cavanagh two different speedster villains two seasons in a row. We need some good guy Wells for a change! Some possible romantic set ups were definitely alluded to this episode. Not only Barry and Patty – who turns out to be an adorable nerd and also has a drive to get justice for a parental death. Additionally, there is a set up between Caitlin and Jay who turns out to be a “part time chemist, part time physicist, and part time Superhero”. Though to be fair, the Caitlin and Jay pairing also works as far as both have lost a part of them (Ronnie and Speed Force). From the sound of Jay’s accident “purifying water and then hit with a blinding light”, it seems like he is the result of the Earth-2 Particle Accelerator – but is it the same set up? Barry learned a new power this episode as he can now slow down in mid run and channel the momentum of his run and toss the lightning like – as Cisco put it – Zeus. If you’re wondering if the ‘planned distraction’ failed for Barry and Jay, it didn’t. Yes the bomb went off, but Jay distracted Sand Demon enough so Barry could rescue Patty and recover from the concussion bomb before Sand Demon had a chance to attack. Garrick referenced a “War of the Americas”, which I’m sure we’ll get more information about eventually. 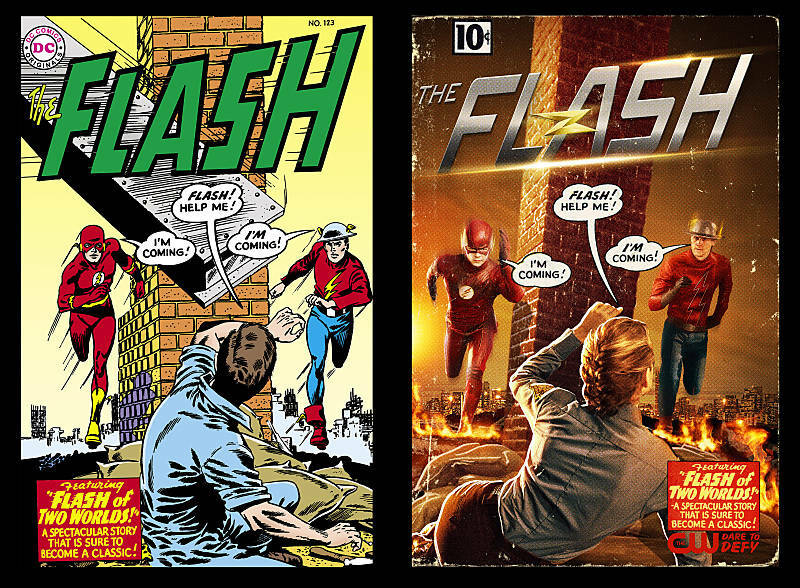 The shot at the end of both Barry and Jay responding to “Flash” and running around a brick pillar was actually a beautiful comic recreation of the cover of Flash Issue 123 when Barry and Jay actually first met in the comics. Additionally, this episode title “Flash of Two Worlds” is directly taken from the cover of that Issue. Joe’s ex-wife is back? I did not see that coming. 52 Portal Breaches is of course a comic reference to New 52, the comic series the Flash writers LOVE to pull from. Next week The Flash returns along with our favorite villain, Leonard Snart whose dad – Colonel Cold – seems to be causing some trouble. This will of course also lead to the set up for Legends of Tomorrow; but the thing I’m happiest to see from the preview is that Snart acknowledges his and Barry’s prior agreement to leave each other alone. If you read last week’s article analyzing Barry’s dream, then you know why I particularly enjoy this piece of confirmed continuity.